Klaus Kinski plays Dracula in Werner Herzog's fantastic and atmospheric version of the classic story. Anchor Bay UK R2 boxset + DVD. German art, has a large gap in its history between 1933 and the early 1950s - the cinema industry in particular had taken a long time to recover from the effects of World War 2. Many of the best pre-war German film makers, including Fritz Lang and Karl Freund, had fled to America, never to return. Through the 1950s and 1960s, most German film production was aimed at the domestic markets only and it was not until the early 1970s that the 'New German Cinema' emerged, headlined by the films of Rainer Fassbiner, Wim Wenders and Werner Herzog himself. However, Herzog felt that this new cinema was divorced from the classic German films of the 1920s, and set out to create a film that would pay homage and tribute to this era, and hopefully connect the two periods together. 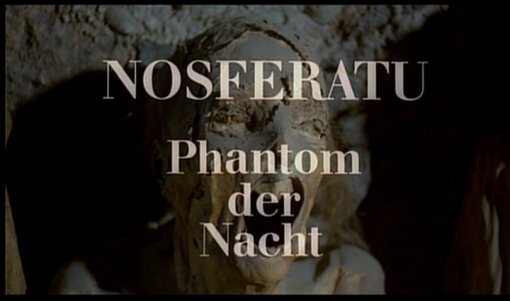 For most of the run-time, Herzog's Nosferatu: Phantom der Nacht (1979) uses the basic story structure and characters from F.W. Murnau's Nosferatu (1922). While the earlier film was driven by copyright expediency into changing names and characters, Herzog is able to change the character's names back to their original Dracula names, but retains many of the curious character changes; most notably the character of Renfield who is given a background, rather than his unexplained appearence in the novel: here he is Harker's boss who sends him out to Transylvania and gradually becomes madder as the Count approaches until he has to be locked in an asylum. Similarly, Van Helsing is a very minor character, a local professor who studies the effects of the vampire from a detatched stand-point and plays no role in his demise. The Murnau film also made several key storyline changes which are retained here, beginning with the film's prologue opening. While the source novel, and hence most films open with Harker on his way to Castle Dracula, here we get an short sequence in Varnia where Harker is dispatched to Translyvania by his agent and has to bid a tearful farewell to Lucy. For budgetary reasons, and to avoid copyright infringment, Murnau replaced the novel's English locations with German cities and pushed the film's setting back to the early 1800s, something that Herzog has faithfully reproduced here. Murnau conveyed many interesting themes in his film that Herzog retains here. Although married, Harker and his wife do not share a bed - the curious implication being that she is still virginal. Accordingly, Herzog changes the name of the character from Mina (who is Harker's wife in the novel) to Lucy (who in the novel is the virginal young woman who, despite her three suitors, is only penetrated for the first time by Dracula himself). After Harker's arrival in the castle there is, in most versions of the film, a distinction between the daytime when Harker is free to roam the castle by himself, and the nighttime when Dracula emerges - the 1922 film makes this distinction very well, with the castle curiously seeming to 'come alive' at night and ironically become more inviting that the shell it appears to be during the day. Most importantly is the theme of Dracula as a pestilence - his almost insect-like appearance is combined with a plauge that follows him onto the Demeter, through the ports where they land and into Varnia itself. Herzog shows this with the swarms of rats that invade the city once the boat lands there. That is not to say that Nosferatu: Phantom der Nacht (1979) is a pure remake, and Herzog's screenplay makes a number of alterations of its own. The most important of these is the change to Count Dracula himself; while Murnau's Count Orlok was similarly animalistic and hideous, he was an evil creature who seemed to enjoy his position - meanwhile Herzog's Dracula is a tragic, almost pathetic creature who mourns his inability to be part of human society and his inability to die. The sequences after Dracula's arrival in Varnia take on an almost apocalyptic feel as the town becomes wreaked with plague, and the film's climax is quite unexpected. Like many of Herzog's best works, the entire film has a dream-like, nightmarish quality to it, helped by some rather surreal scenes that increase in intensity towards the end, particularly after Dracula's arrival in Varnia. In keeping with this atmosphere, the film's pacing is suitably sedate, but it never drags and the 100 plus minute run-time feels more like 90. It is clear from the opening shots of mummified corpses, with a powerfully haunting score, that Nosferatu: Phantom der Nacht (1979) is going to be a very different experience to most Dracula films. Filmed entirely on location, with many scenes shot in Eastern Europe, the landscapes are as much a part of the film as the actors. Harker's journey to Castle Dracula becomes a real journey into darkness and shadow. The film is geniunely scary in a way that few other Dracula pictures have achieved, every shot of the Count carries a powerful atmosphere and brings a real sense of dread. The interior of the castle is no comfort, it is certainly not the well lit, inhabitable abode of Hammer's Dracula (1958), rather the paint is old and peeling and the walls are dirty in a way that studio work rarely captures - the use of real locations obviously has the advantage of allowing much longer single-take camera runs as the camera 'walks' down long and labyrinth corridors with Harker and you can see the massive forests outside the windows. There are a number of nice 'reference shots', reproducing classic scenes from the 1922 film, including the Demeter's silent, drifting arrival into Varnia and the vampire's late night visit to Jonathan's castle bedroom. The film's atmosphere is boosted by a very strong soundtrack from Florian Fricke, who also wrote the similarly haunting scores to Herzog's Aguirre (1972) and Heart of Glass (1976). The use of the 'choir organ' stop in particular helps to creates the incredibly strong atmosphere, and there is some interesting use of the opening from Wagner's Das Rheingold - a piece that seems to be continually building up to to climax that never comes. Klaus Kinski again takes the lead role, and although he has much less screen-time than in his other unions with Herzog, when he is onscreen he completely steals the show with a wonderfully haunted performance. Bruno Ganz has the most screen time and gives a very strong performance as the terrified Harker. Isabelle Adjani looks very beautiful as Lucy. Werner Herzog's tribute to German cinema history is a very well made film, and if not an improvement on the original, it is a worthwhile accompaniment. As a Dracula film, it takes many liberties with the plot, but does sucessfully capture an otherworldly atmosphere that is missing in many interpretations. Herzog/Kinski fans will certainly want to see this production, it is highly recommended to classic horror fans and comes recommended to all cinema fans. Anyone famous in it? Klaus Kinski - One of the biggest names in Euro-cult cinema, most famous for his 5 films with Herzog. Bruno Ganz - A respected German actor who recently played Hitler in the powerful Downfall (2004). Any violence/gore? A lot of death, but almost no blood and no violence. Eerie and geniunely scary, this film is highly recommended to all, especially horror fans. Good soundtrack A powerful and haunting score from Florian Fricke that really builds the atmosphere. The print is of a good quality, with minimal damage and some grain, but a general softness to the image. Audio German 5.1 and 2.0, both sound fine. Subtitles English - translates the German track. Availability The single disc version is included in the Herzog Kinski collection boxset. Also available on a 2 disc edition released seperately. Audio Commentary with Herzog and moderator Norman Hill. Detailed and interesting. The boxset release includes talent bios for Kinski and Herzog. Other regions? Anchor Bay R1 DVD - sharper print. The loving tribute to the classic horror film is wonderfully atmospheric with a haunting lead performance. Highly recommended. A good, although soft print with a good soundtrack. The commentary is interesting, but the documentary is priceless. The English version of the film on the 2-disc edition is interesting but not worth a separate purchase. Find our reviews of other films starring Klaus Kinski, scored by Florian Fricke or directed by Werner Herzog. Review of the Herzog Kinski Collection boxset. All text in this review written by Timothy Young - 17th August 2006.